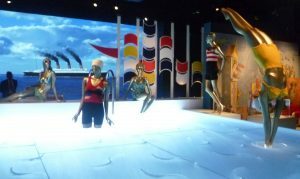 Earlier this week I was invited to the preview of the new blockbuster exhibition at the Victoria & Albert Museum: Ocean Liners: Speed and Style. If you want a bit of luxury and glamour – and who doesn’t? – this is a must see exhibition. So this week I’m inviting you to come with me back to the glory days of the Ocean Liner and let me take you on a luxury five day London to New York trip – no expense spared. 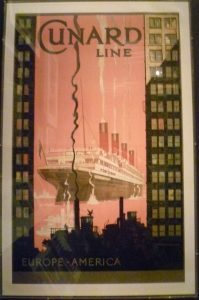 We are travelling First Class – naturally – with one of the top shipping lines for speed, comfort and attention to detail; perhaps Cunard, or maybe we are on the French liner Normandie, who prided herself on being even faster than the Queen Mary. We are travelling after 1930 – and this is a must. It was in 1930 that the Conte di Savoia first introduced gyrostabilisers which made travel a whole lot more comfortable; no more being sea-sick, or watching your meals sliding off the tables in the dining room. We are greeted on deck by a bellboy who looks about fifteen – and probably is. His job is to make sure Madame or Mademoiselle has a deckchair and, if it’s chilly, he will bring you a warm woollen blanket to put over your knees. Naturally, he will also fetch you a cocktail. 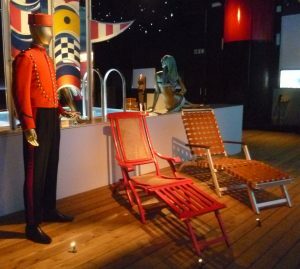 The bellboy above is wearing a French uniform, and the deckchair next to him dates to 1935. We must keep out eyes peeled for who else in travelling. Marlene Dietrich is a frequent traveller, for example, or we might be lucky enough to meet the handsome and dashing U.S. diplomat, Anthony J. Drexel Biddle Junior, famous for his style. Here he is, gazing out to sea – and being careful to stand in the sort of pose which says: I know that I am an attractive (and wealthy) man and I am well aware that women will look at me. Who knows, I may meet you at dinner. 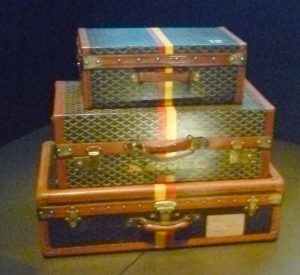 Luxury suitcases from the 1940s. You are now in your luxury cabin and your luggage has arrived which a maid is unpacking for you. The set of suitcases in the photo above dates from the 1940s and belong to the Duke of Windsor who frequently crosses the Atlantic, often with as many as 100 pieces of luggage! So, let’s look around the ship. 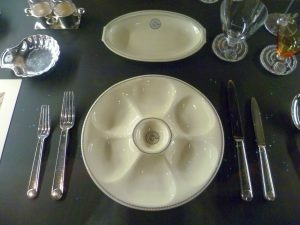 In the 1920s and 30s, Art Deco was the prevailing fashion, and luxury liners underwent frequent redecoration to keep them up to date. Above we see some of the wooden wall panelling from the Beauvais suite on the Ile de France, 1927. It is made of different-coloured marquetry in a floral design. The centre of the panel has a Lalique light which simulates rays of sunlight. It is very much in the French grand style. 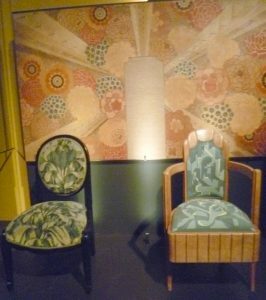 The two chairs are also French. Very classy, I think you’ll agree – though I’m not sure they look very comfortable. 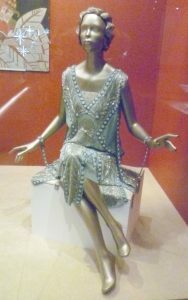 Silk georgette and glass beaded ‘Salambo’ dress by Jeanne Lanvin, 1925, worn by Miss Emilie Grigsby. It is time to dress for dinner. What will you wear? Your maid whispers that some fashionable travellers buy a completely new wardrobe just for the voyage! Everyone is wondering what the Kentucky-born beauty and socialite, Emilie Grigsby, will be wearing. It’s bound to be something both daring and fashionable. If that doesn’t appeal, what about the silk crepe red dress (Lucien Lelong, Paris, 1935) worn by Mme Bernadette Armal on the maiden voyage of the Normandie. I love this dress; cut on the cross, its folds cling to the body sensuously. 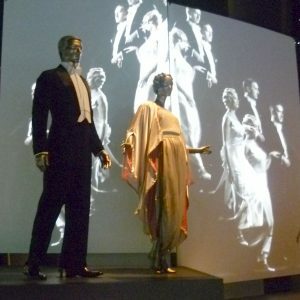 Many French couture houses sent representatives for an on-board show for this trip, where they each showed a garden party dress, a tailored ensemble and three evening gowns. It is the perfect venue: A-list guests and a captive audience for five days – what else is there to do on the voyage but spend money? 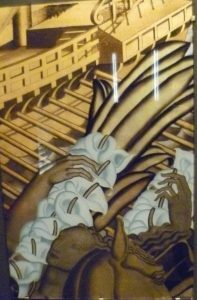 The Normandie is famous for its top quality Art Deco style. It has a spectacular 140 metre long Grand Salon with a giant glass mural of over 400 panels, predominantly in black and gold and reverse-painted on mirrored glass. It is undoubtedly impressive but I’m not sure I like it. You have decided what to wear and your maid has artfully attended to your makeup and hair, and eased you into your chosen evening dress. 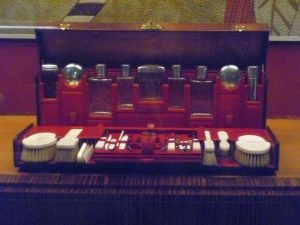 The contents of your Louis Vuitton toiletries case, hand-made in Morocco leather, brass, wood, crystal, silver, ivory and glass, give you confidence. Will that connoisseur of beautiful and well-dress women, Mr Anthony J. Drexel Biddle, Junior, be there? And will he notice you? This is the ceremony where first class passengers descend the beautifully curved staircase to the first class dining-room, which shows off their every move. There is the shimmer of silk as the ladies sashay down the stairs. 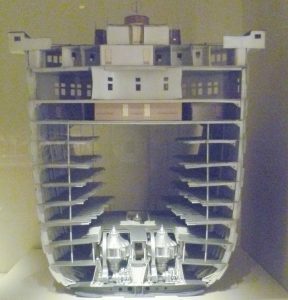 Passengers from the lower classes on the ship might watch and applaud, but they do not, of course, join in. (The background shows a film of the famous Grande Descente.) Mr Drexel Biddle, Junior, is indeed there, on the stairs, dressed in the fashionable evening wear of the day. Mr Drexel Biddle smiles and offers you his arm and, together, you move towards the best dining table. Other women watch you enviously. Time passes …. Before you part, he asks you to meet him by the swimming pool the following morning. Here we see a variety of swimwear. The lady on the left, sitting by the edge of the pool at the back is wearing a 1968 bikini; the lady standing knee deep in the water with a white swimming cap, sports a red and black 1925-9 swimming costume. The man standing on the side at the back, right, wears a 1926 man’s swim suit; and the lady doing a handstand in the water wears a mustard-yellow two-piece swim suit. Who would you choose to be? All to soon, our voyage is over and we must return to real life. I hope you have enjoyed the trip. I hope you enjoy it as much as I did, Jan. Some of the items, like the piece of elaborately carved panelling from the Titanic, found floating on the sea above where she sank, are unbelievably poignant. Oh, you’ve swept me back to my youth, Elizabeth! We used to travel on ocean liners from Africa to the UK and back again, before air travel became the cheaper option. My best-remembered voyage was when I was 13. First kiss under the stars turned me into an incurable romantic and is, I believe, almost wholly responsible for my ending up a author of romance. It was the fifties, but the glamour and strangely isolating experience of being on this little moving island in the sea for two weeks remained just as glorious as you have depicted beautifully here. Lucky you, Elizabeth! First kisses can be rapturous – or disappointing. I’m delighted that yours was the former, and in such a romantic situation, too!